Maybe my favorite video of the brilliant Mr. Carl yet to surface on YouTube. To visit Mr. Evanier's blog News From Me, please click here. The contemporary "Euro-Boxing Gag" as seen on Circus Arena in 2007. I'm sad to announce that the great Carlo "Charlie" Colombaioni, age 74, passed away yesterday. Without make-up nor costumes, speaking only in Italian in the five continents and amusing the world. Carlo, with is brother-in-law Alberto Vitali, left the circus in the late 60s beginning the "revolution" of new clowning in the theatre. 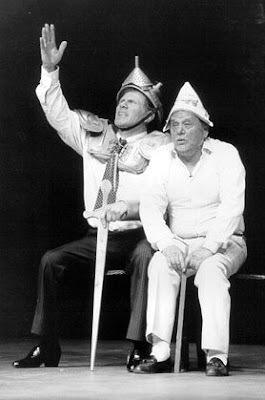 They were the first duo to introduce clowning in theatre. Carlo was the major inspiration to both Dario Fo and Fellini for the reflections about clown of this two great masters. He was the major consultant for "The Clowns" movie, and behind all the Dario Fo plays involving clowning. He was part of a large clown dynasty: about his nephews are also David Larible and Fumagalli. 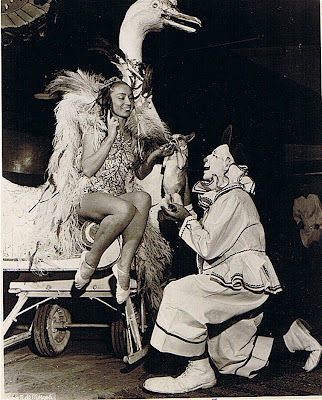 He also was one of the first ever to involve audience participation in clown entrées. My pal Bryan Fulton made the local papers yesterday. To read the story please click the title of this post. 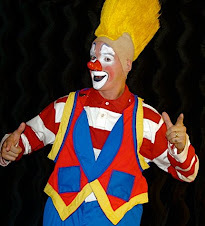 To find out more about Bryan's entertainment company, ALL STAR TALENT (where I am still not listed under "clowns" because Bryan is too lazy to add my photo) please click here. Wade's sons Eric and Adam with David Kiser on the Blue Unit of the Ringling Bros. and Barnum & Bailey Circus. 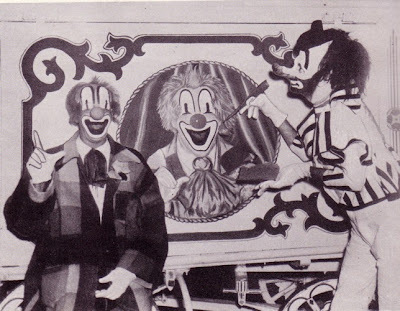 Here are Billie Burke, Gene Lewis, & another clown I'm not familiar with, actually I was never familiar with on the Terrell Jacobs Circus on the James E. Strates Show Carnival in 1952. Rapidly becoming my favorite Russian clowns of all time, here's more Mustafin and Abdivkeev. Four Ringling Bros. surrounding Ms. Ella Bradna, wife of longtime Ringling equestrian director Fred Bradna. I can't positively ID any of the four but the one in the bottom left corner may be a very, very young Felix Adler. This exceptional document is the first reprise ever of Andrei Jigalov in 1991. Here he is with his first partner, Eduard Alexeenko, who passed away too young. They met at the Moscow creation studio for circus, forming their duo. Their first material was directed by the great Valentin Gneushev. This is a gala in honour of Mr.Nikulin at the old Moscow circus. I first saw this duo right in those days at this very same circus, and immediately falling in love for them. The following year Dominique Mauclair, upon suggestion of Mr.Nikulin, invited them in Paris at the Cirque de Demain festival, where they won. CLOWN ALLEY: Another Step Closer!!! "CLOWN ALLEY (CBS, 10-11 p.m.). 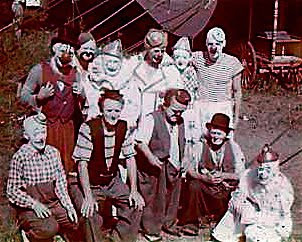 Red Skelton & Co. in a special tribute to the circus funnymen. With Jackie Coogan, Audrey Meadows, Robert Merrill, Vincent Price, Martha Raye, Cesar Romero, Amanda Blake and Bobby Rydell." This Red Skelton television special aired only once (as far as I can tell) and no copies have ever surfaced in any part of the collector's market. Both Greg DeSanto and I have contacted the folks at Red's archives and have both been told that there is absolutely nothing in the vault labeled "Clown Alley", so unearthing this promo is certainly a major find! For more information on the show from an earlier post, please click the title of this post. And if anyone out there has a copy, PLEASE contact me!!! The always beautiful Ms. Tammy Parrish with Wade's sons (and my friends) Eric and Adam Burck in what looks to be the old Ringling Winter Quarters at the arena in Venice, FL. Eric is currently attending culinary school; Adam is performing his tiger act on the Hamid Shrine Circus. 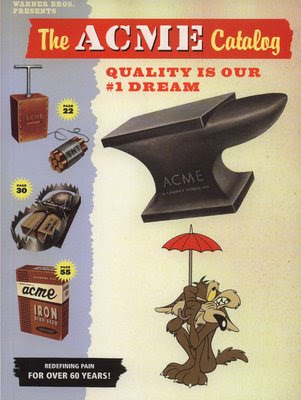 A complete listing of every ACME brand product ever used in a Warner Bros. cartoon is available here. "(Clown)... wants over and over again movement: it sees peace only in dynamism." 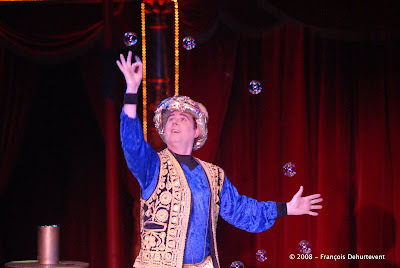 Darren Burrell, formerly of the Kelly-Miller Circus and Ringling, currently performing his bubble act on Roncalli. If I had to guess I'd say that this might be a young Duane "Uncle Soapy" Thorpe at the beginning of his career, before he developed his classic neat whiteface makeup that we all remember. A rare shot of Mr. Burke without his trademark top hat. "I have forced myself to contradict myself in order to avoid conforming to my own tastes." ATTN NYC! This Wednesday! One Night Only!!! Charlie Lewis on Clark & Walters Circus in Carl Junction, MO in 1966. Along with Bobby Kellogg, co-creator of the Washer Woman Gag Johnny Tripp. Mr. Tripp with someone who looks to me like he might be Milt Taylor. 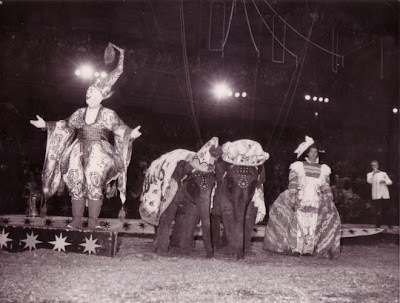 The Shanini, the first classic musical entrée of the Soviet Circus era. In various versions, this act was presented by the 50s to the 80s. 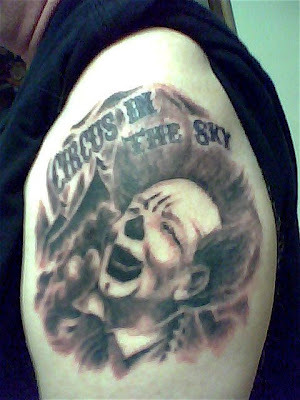 To honor the memory of my friend, Joe Vani, I have had the tattoo pictured above applied to my left upper arm. This way, I'll have Joe with me always. I knew Harry Dann well; he was a good Friend of mine. He was also a famous clown. For those of you who may be interested in the life & death of Harry Dann, I've written his biography for Find-A-Grave which can be found by clicking the title of this post. At the present time, Harry's bio is among the 21 million non-famous deceased persons. In spite of my protestations to the contrary, Robert Edwards, one of Find-A-Grave's Administrators, felt Harry wasn't as famous as Felix B. Adler or Chester & Joe Sherman (other bios I have written for Find-A-Grave). As Robert explained to me (his own words): "Yours is a purely subjective opinion. A Google search of Harry Dann yields a few mentions in clown-related blogs and not much else. Being an inductee of the International Clown Hall of Fame is really too niche-like - how many halls of fame are there these days for all sorts of things? He doesn't even have his own Wikipedia bio. Nothing at all to indicate any broad-based, lasting notoriety." Perhaps if Pat Cashin and others will post the link to Harry's memorial page on their websites, and others of you will click on the link and leave sentiments, Find-A-Grave will reconsider and put Harry Deems Dann where he belongs - along with Felix B. Adler, Chester & Joe Sherman, and Emmett Kelly Sr., in the Famous section. The matter is entirely in YOUR hands now. I Thank You for any help you are willing to give, but you won't be doing this for me - you'll be doing it for Harry. He surely deserves his own famous page, wouldn't you agree? P.S. If you're not already a member, you need to register as a member of Find-A-Grave in order to leave flowers and a message, but it just takes a minute, and believe me - your information is ENTIRELY safe and is shared with NO ONE. 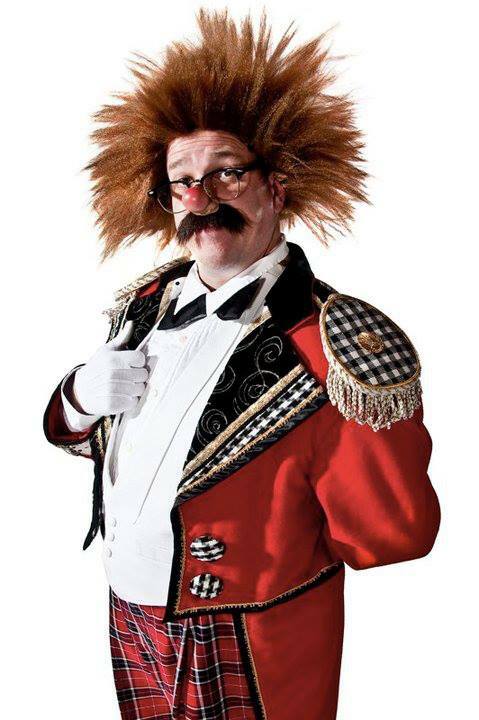 One of the nation's most recognizable circus clowns, he gained fame as "America's Picture Clown", a title given him by Ringling Bros. and Barnum & Bailey circus publicist Roland Butler, referring to Dann's popularity with press photographers visiting the circus and their resulting numerous studies of him in his classic face makeup and clown wardrobe. His costumes were the envy of his peers; he owned over a hundred custom creations, all designed and hand-sewn by his seamstress mother, until her passing in 1954. His image graced the pages of at least two national magazines in the same year (National Geographic and Holiday). 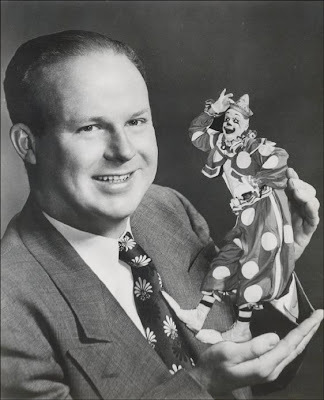 He was included on the cover of the 1951 Ideals Magazine circus issue, an international favorite among memorabilia collectors. 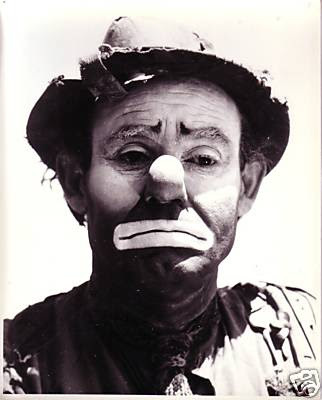 He became one of the top four most photographed clowns of the era, sharing the spotlight with fellow funnymen Felix B. Adler, Emmett Kelly, and Lou Jacobs. 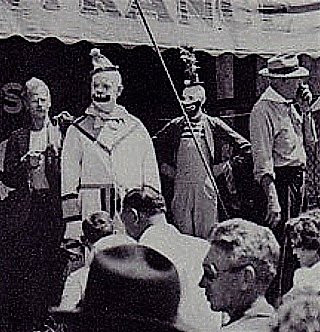 The son of St. Louis Missouri banker William J. Dann and Beatrice Deems Dann, he decided after seeing his first tent show that he wanted to become a circus clown. 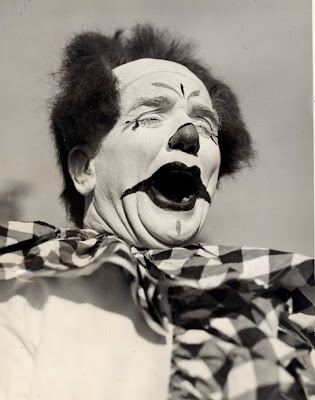 In 1941, at the age of twenty, he became an apprentice ("First Of May") member of clown alley with "The Greatest Show On Earth", Ringling Bros. and Barnum & Bailey circus, much to the protestations of his father, who had a career in banking in mind for his son. In the circus profession of generation-grounded participants, he was the only member of his family to perform under the big top, on America's largest tented circus, so large in fact it was nicknamed "Big Bertha" and traveled on two full railroad trains. 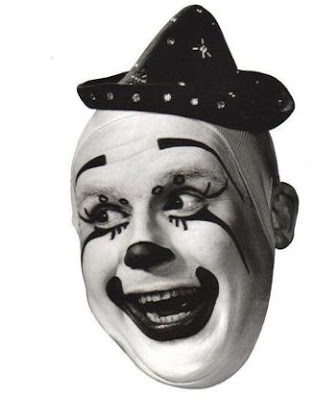 In addition to his highly-photogenic "clean" whiteface makeup and extensive show wardrobe, he was a talented trombone player, which came in handy as he performed with a number of clown bands over the years. He was very proficient at training ducks, using a number of them in his clown acts, "Horatio" being his first such star. 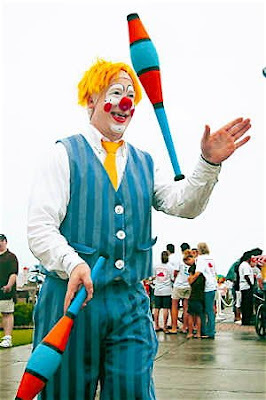 He also trained and worked with dogs, built props and created the snake in the basket clown routine, wherein a clown carrying a basket is surprised by a giant snake rising from the basket, kissing the clown on his nose, then disappearing back into the basket (a false arm holding the basket allowed the clown's free arm to operate the snake puppet). 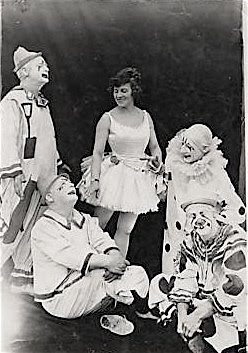 Another Harry Dann clown gag popular to this day is the mermaid, which he devised with fellow clown collaborator Bobby Kellogg during their Ringling years. This gag featured a sailor carrying a mermaid all the way around the track as the mermaid primps and preens in a seashell-encrusted mirror "she" holds. The mermaid was of course the clown with a false fishtail secured around his waist, and the sailor maniken's head and body walked by virtue of the mermaid/clown's own legs. 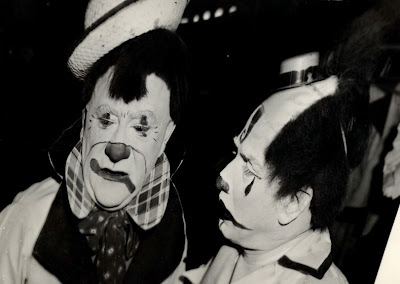 On the Ringling show and in later years for other circuses he clowned with his peers Kellogg, The Sherman Bros. (Chester & Joe), Freddy Freeman, and Paul Jung. 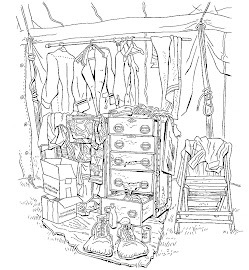 A graduate of University City High School in University City Missouri, he coached the circus children daily in their school work, and off-season at winter quarters served as high school teacher for them throughout his career. 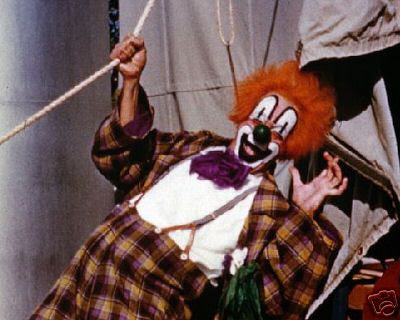 He left Ringling after eight years to clown with Louis Stern's smaller Polack Bros. circus, popular with performers for its more comfortable indoor Shrine-sponsored dates. 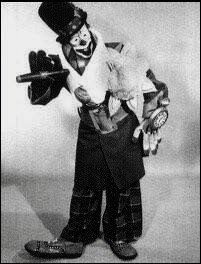 He appeared primarily with that show as one of its star clowns through 1959, alternating seasons on the tented Frank McCloskey-owned Clyde Beatty-Cole Bros. Circus, and family-owned Christiani Circus. In 1966 he signed with the under-canvas Carson & Barnes Circus owned by D.R. and Isla Miller. 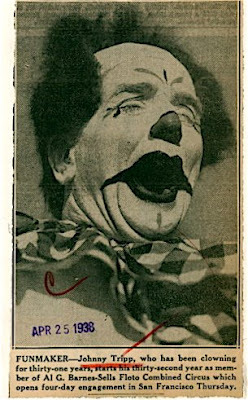 In his final seasons with Carson-Barnes he set aside his popular clown character, explaining "too many wrinkles" made his celebrated makeup "no longer possible" to wear properly. 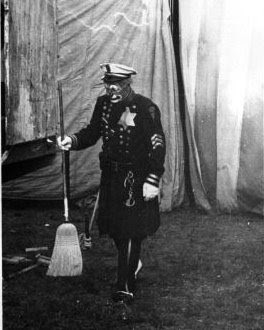 He instead performed in the capacity of sideshow barker and circus ringmaster until the end of the 1970 season, the same year of his death. In rapidly-declining health, on December 29, 1970, he was rushed by ambulance from Carson and Barnes winter quarters in Hugo, Oklahoma to De Paul Hospital in St. Louis Missouri (a ten to twelve hour drive), where he expired the following day. The world-renowned countenance for which he will be remembered - his trademark clown makeup - is considered by his peers, circus entrepreneurs, generations of circus fans and makeup artists alike to be one of the most universally acknowledged examples of traditional whiteface makeup ever designed and applied. 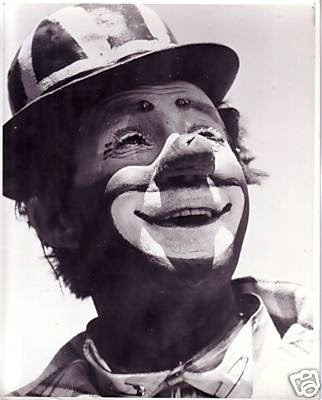 Years after his passing, photos and renderings of him are still being used in circus press releases, and adorn circus posters and wagons throughout America, a tribute to his "Picture Clown" status, makeup artistry, and clowning abilities. Cause of death: Miliary Tuberculosis. 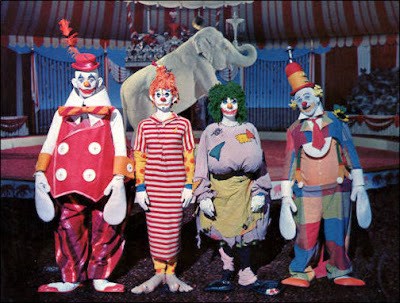 This is, from left to right, Stephen Boyd, Doris Day, Martha Raye, and Jimmy Durante from the 1962 film "Billy Rose's Jumbo" that includes adaptions of both the Boxing Gag and the Washer Woman with Bobby Kay and Albert White hired as clowning consultants. Mr. Boyd and Mr. Durante seem to have divided Pepito's wardrobe in half, Mr. Boyd taking the collar and vest with Mr. Durante taking the hat and tie. 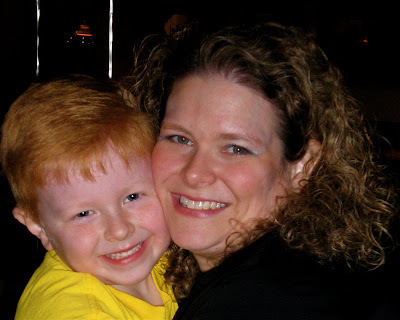 Thank you for Henry Penndorf for the second photo!